1941 World War II Taiwan Times Japanese Wall Map of the Philippines. WE SELL ONLY ORIGINAL ANTIQUE MAPS - NOT REPRODUCTIONS JOIN OUR WEEKLY MAILING LIST FOR NEWEST STOCK. 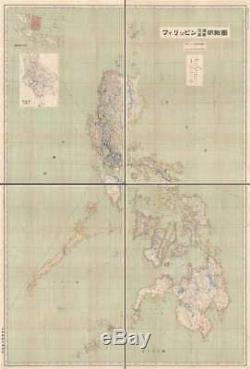 Description: An impressive 1941 Showa 16 Japanese map of the Philippines. This enormous production covers the entirety of the Philippines in incredible detail. It was issued by the Japanese Bureau of Information just months before the December 1941 invasion of the Philippines. The focus of the map is the Philippine transportation network. The level of detail evident in this map illustrates the extreme interest the Japanese had in the Philippines, not only as a source of personnel and resources, but as a stepping stone to Southeast Asia and Melanesia. This map was issued by the Taiwan Governor's Office propaganda newspaper, the Taiwan Times. It is rare with the OCLC identifying only one other example in the collections of Cornell. We are aware of one other in private hands. Size: Printed area measures 79 inches high by 54 inches wide. Minor wear on original fold lines. If your address is a P.
Additional Services Conservation Framing Services: Geographicus recommends basic conservation framing services for any antique paper. We do not offer this service. Antique Map Restoration Services: Geographicus can repair and restore your antique map. Services include deacidification cleaning flattening and backing. The item "1941 World War II Taiwan Times Japanese Wall Map of the Philippines" is in sale since Thursday, September 20, 2018. This item is in the category "Antiques\Maps, Atlases & Globes\Asia Maps". The seller is "geographicusmaps" and is located in 11221. This item can be shipped worldwide.